In Hot Dog, culinary historian Bruce Kraig posits that the classic Chicago-style dog is a reflection of the city's early-20th-century demographics, incorporating the tomatoes of Mediterranean Italians and Greeks as well as the mustard and pickles of German and Jewish immigrants. And Bob Schwartz, in Never Put Ketchup on a Hot Dog, suggests that the Louisiana sport peppers and celery salt are the contributions of African-Americans who came north during the Great Migration. These are now canonical condiments on the Chicago dog, but shifting ethnic influences continue to shape the evolution of this iconic street food. 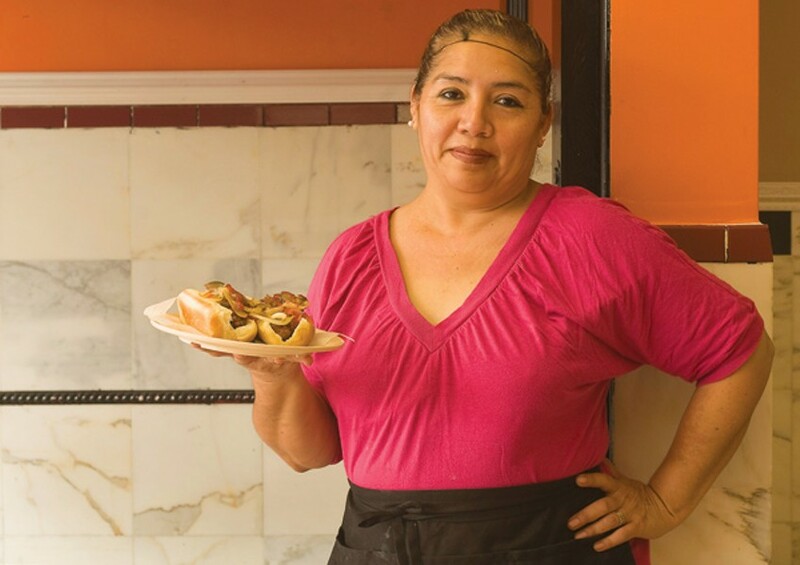 For eight years, Guerrero-born Blanca Diaz sold Mexican hot dogs from her cart at 26th and Saint Louis, attracting a devoted neighborhood following. Peter Engler, Anthony Bourdain's go-to guy for street-level intel on the Chicago edition of No Reservations, has pronounced them "shockingly tasty." Diaz put in 12-hour days, whatever the weather. "It was very sad," she says, "very hard work." A few months ago she took out a lease on a brick-and-mortar place starting August 1, but she continued selling dogs from her cart as a means of alerting customers to the new location. On August 15, she was busted and locked up at Cook County Jail for selling food without a license. Diaz was shaken—she can hardly talk about the experience without getting teary—but she says she's "not ashamed to be put in jail for working." She supports several family members stateside and several more back home in Acapulco. Her hearing is set for October. In the meantime, on Saturday, September 12, Diaz's fully licensed Delicias Mexicanas opened in Little Village, with the Mexican hot dog at the top of its menu, where it's called simply "Hot dog con tocino," or "hot dog with bacon." The dog is wrapped in the cured meat and they're griddled together, allowing the juiciness of the bacon to saturate the sausage. Toppings vary regionally, but at Delicias Mexicanas, the con todo gets grilled onion, both grilled and pickled jalapeños, tomatoes, mayo, mustard, and . . . ketchup. That's right—ketchup. The one condiment that's anathema to defenders of the traditional Chicago-style hot dog is standard on this street sausage. And it works beautifully, playing off the crunchy sweetness of the onions, complementing the sourness of the mustard, providing relief from the heat of the jalapeños. Moving up from pushcart to storefront isn't an uncommon progression for the hotdoguero. Portillo's multilocation miniempire began in a small trailer called the Dog House in Villa Park. El Guero Canelo, a Tucson restaurant that helped popularize the Mexican hot dog, also got its start on the streets. Diaz speaks with the forward-looking vision of the immigrant entrepreneur, describing her life as "fronteras y fronteras y fronteras" ("frontiers and frontiers and frontiers") and hoping that she can be a kind of "example for those still struggling on the street." Open till 5 AM on weekends, Delicias Mexicanas attracts a late-night crowd. I asked server Carina Gomez if they had any trouble with guys stumbling in at the dawn's early light, shortly after last call. She said they don't at all—most of the guys are old customers of Diaz from the days when she pushed a cart, and "they have too much respect for her to cause problems." The Diaz family believes the Mexican hot dog originated in Guerrero. Others say the Mexican hot dog was born in the northern Mexican state of Sonora, and in Tucson you'll just as often hear it called the Sonoran hot dog. Some contend it's more likely a product of Mexico City. And food historian John T. Edge speculated in a recent New York Times article that its origin might be much closer to home, pointing out that in 1953 Oscar Mayer was running print ads selling American consumers on the virtues of bacon-wrapped hot dogs and suggesting that "perhaps Mexican consumers . . . took Oscar Mayer at its word, wrapping American-made hot dogs in American-made bacon, and claiming the resulting construction as their own." You can approximate the flavor of a Mexican hot dog at your local Five Guys by ordering a bacon hot dog topped with grilled onions, jalapeños, mayo, mustard, and ketchup. But you won't get the magical fusion of wiener, bacon, and condiments that characterizes the real deal. Engler thinks that "stewing the dogs and—just as important—the onions and jalapeños in half an inch of bacon fat makes a significant difference." Not for nothing is the Mexican hot dog is referred to in some parts of Los Angeles as the danger dog.